Luxembourg is a constitutional monarchy and is officially called Grand-Duché de Luxembourg. A hereditary grand duke or grand duchess of the house of Nassau serves as the monarch and head of state. The constitution, proclaimed in 1868 and later amended, provides for a democratic government, with legislative power vested in a unicameral national legislature called Chambre des Députés. The 60 members of the Chamber of Deputies are elected by proportional representation to five-year terms by citizens. The capital and largest city is Luxembourg City, also known as Luxembourg-Ville. The heritage of modern Luxembourgers derives largely from the Celts, Franks, and other Germanic peoples who moved across the region before and after the Roman occupation. From this rich cultural heritage, Luxembourgers have developed a keen sense of national identity. In ancient times the area of Luxembourg was inhabited by the Treveri, one of the tribes of Gaul. Later, under Roman rule, Luxembourg was included in the province of Belgica Prima. The Franks invaded Luxembourg in the 5th century AD, and in the 9th century it became a part of Charlemagne’s empire. In the 10th century, Siegfried, Count of Ardennes, reconstructed a ruined fortress on the site of present-day Luxembourg City. A small town grew up around the stronghold. In 1060 the region came under the control of Count Conrad, founder of the house of Luxembourg, which provided the Holy Roman Empire with four emperors in the 14th and early 15th centuries before being superseded in 1437 by the Habsburg dynasty. For the next four centuries, Spain and Austria alternately dominated Luxembourg. At the close of the Napoleonic Wars in 1815, Luxembourg was established as a grand duchy by the Congress of Vienna and placed under the rule of William I, king of the Netherlands. However, Luxembourg was simultaneously placed within the German Confederation, and Prussia was permitted to garrison troops in Luxembourg City. In 1830 the Belgian provinces of the Netherlands revolted. The grand duchy, apart from Luxembourg City, joined them. 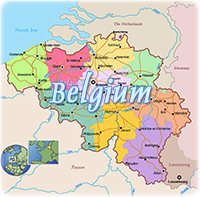 By the end of that year, Belgium had become an autonomous kingdom, and Luxembourg remained a part of the new country until 1839, when its western portion was ceded to Belgium. Luxembourg, greatly reduced in size, gained more independence, although the Dutch king retained nominal authority as grand duke. Luxembourg became a member of the Prussian-led German customs union called the Zollverein in 1842. With the dissolution of the German confederation in 1866, the continued presence of Prussian troops in Luxembourg City became a source of concern to France. Napoleon III, emperor of France, opened negotiations in 1866 with William III, king of the Netherlands, for the purchase of Luxembourg. The proposal provoked a dangerous crisis in Franco-Prussian relations. War was averted by an international conference held in London, England, in May 1867, that produced a treaty guaranteeing the independence of the grand duchy and providing for its perpetual neutrality. When William III died in 1890 without a male heir, the grand ducal crown passed to Adolf of the German house of Nassau. In 1912 the Frankish Salic law, which barred female succession to the throne, was repealed and Marie Adélaide became Luxembourg’s first grand duchess. In 1948, an agreement establishing the Benelux Customs Union among Belgium, the Netherlands, and Luxembourg. By 2002 the citizens of Luxembourg enjoyed the highest gross domestic product (GDP) per capita in the world. Quartier du Grund, in Luxembourg, and the church Saint-Jean-du-Grund.